I fought back tears as I watched and listened to them read notes and pray while holding hands around a corner. The only thought running through my mind was, “this is Joel and Anna. This is why they are so special.” The laughter, the tears, the joy in that moment resounded throughout their entire day. Their families, their friends, everyone present could feel and experience the love that these two have for each other and how they express that to all around them. This spring, Crago Farms wedding is one that will live in the hearts of each person present for a long time. Joel and Anna are college sweethearts and I can still remember reading their proposal story for the first time and giggling a bit. It is such a great picture of both of them and their personalities! After they graduated, Joel moved away for a while and they became a long distance couple. Sometime during that time and after a visit to his parents, Joel decided it was time to propose. He ordered the ring, asked her parents for their permission and as soon as he had both, he hopped in the car and drove 3 hours to find Anna sitting in her living room. She was muddy from walking the dog and answering a few work emails before giving Joel her full attention. She had no idea what was about to happen. Meanwhile, he was standing there “dying to propose”. Anna went on to say how sweet and genuine it was and how she still couldn’t believe it was real. She was going to be a wife! I’ve been anxiously awaiting this wedding day since Joel and Anna’s Fall Engagement Session! And when MD (my second photographer) and I arrived at Crago Farms on Saturday it was a culmination of everything Anna and I had been chatting about since the beginning. Her vision of simple, white and green played out beautifully with the touch of blush as an accent color. Generally wedding days are pretty high speed, without much down time, and they tend to not run on time (at all) just because of everything that’s going on. But throughout Joel and Anna’s entire wedding day, we were ahead of schedule! That alone was a miracle! To top it all off, the forecast for Saturday was supposed to be rain and clouds and just not pretty stuff. But we didn’t see a single rain drop all day! Joel and Anna were able to get married right on the water, have some amazing portraits and the sun even popped out right at sunset to give us some glow! It was just perfect! The things that I could say about this wedding are endless. But, I’ll stop right here with this. Joel and Anna, I’m so thankful that the Lord brought you two into my life and that you gave me the honor of being your photographer! Your day was absolutely beautiful, but the marriage that has just begun is what I am most excited for! Congratulations again, Mr. and Mrs. Perry! I love this inscription from Anna on the back of Joel’s watch! Anna’s sweet momma couldn’t hold back the tears after she put her dress on. 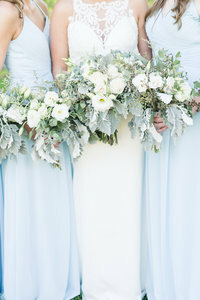 These bouquets! The simplicity of the white, green and hints of blush make them so classic! Just the joy in the moment. Cue all the tears all over again. His face. And the way his groomsmen are smiling at him. This bridal party was just fabulous! So easy going and they were legitimately shouting in this! Can you tell? Anna’s long veil was what dreams are made of. Long veils create such beautiful portraits!